The future of our food depends on tiny seeds in orchards and fields the world over. In 1943, one of the first to recognize this fact, the great botanist Nikolay Vavilov, lay dying of starvation in a Soviet prison. But in the years before Stalin jailed him as a scapegoat for the country’s famines, Vavilov had traveled over five continents, collecting hundreds of thousands of seeds in an effort to outline the ancient centers of agricultural diversity and guard against widespread hunger. Now, another remarkable scientist—and vivid storyteller—has retraced his footsteps. In Where Our Food Comes From, Gary Paul Nabhan weaves together Vavilov’s extraordinary story with his own expeditions to Earth’s richest agricultural landscapes and the cultures that tend them. Retracing Vavilov’s path from Mexico and the Colombian Amazon to the glaciers of the Pamirs in Tajikistan, he draws a vibrant portrait of changes that have occurred since Vavilov’s time and why they matter. already been lost. But he also shows what resilient farmers and scientists in many regions are doing to save the remaining living riches of our world. It is a cruel irony that Vavilov, a man who spent his life working to foster nutrition, ultimately died from lack of it. In telling his story, Where Our Food Comes From brings to life the intricate relationships among culture, politics, the land, and the future of the world’s food. "Mixing the compulsively readable insights of a well-researched biography with the painstaking details of a scientific treatise, Nabhan offers a historical and contemporary framework for determining the viability of sustainable agriculture." "Where Our Food Comes From is a marked critique of the worldwide simplification of agricultural systems. It pins its hopes on local, traditional agriculture and is sceptical of top-down approaches to increasing food production, such as calls for another 'green revolution'." "Equal parts travelog, biography and botanical history, Nabhan breathes life into the exploits of Russia's botanical adventurer." "The book pays homage to a martyr who understood that crop varieties must be preserved for the future food security of the human race. As Nabhan points out, the risk today is no less than in Vavilov's time, and it may be greater." "In this incredible tale that leaves you wanting more, Nabhan spices up his narrative with sprinkles of historical detail, and shows history's impact on food production and, subsequently, the food security of nations…part history book, part travelogue, and part detailed scientific explanation of why our planet's survival depends on maintaining and guarding the biodiversity of plant life. Not one of these ingredients is any less appealing than the others. Dig in and enjoy it." 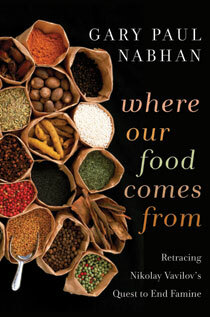 "A blend of travelogue and biography, Nabhan's book is a sobering reminder that while food is necessary for our survival, it is not always easy to come by, nor is access to food completely under our control." "Any book with ethnobotanist Nabhan's name on it is going to be worth a read but this one's a grabber. A thriller, a tragedy and self-help—all in one." "In this beautifully told nonfiction narrative, Nabhan shows how climate change, economics, genetic engineering, and tiny seeds all over the world will affect our future." "Fascinating look at the origins of our food and shows how climate change, free trade policies, genetic engineering, and loss of traditional knowledge are threatening our food supply." "Where Our Food Comes From is an urgent reminder that we must work to save not only the seeds that feed us but the farmers who grow and select them—those 'vernacular plant breeders' on whom the long-term vitality of those seeds and a diverse agriculture depends." "In this part travelogue, part history, and part treatise, Nabhan ... eloquently describes how current agricultural practices may be helping to erase the diversity that Vavilov was so anxious to preserve...This work would be an excellent resource for discussions and debates." "9 Must Read Books on Eating Well"
"Ethnobotanist Gary Nabhan has created something here as original as a new species: a book that is equal parts biography, pilgrimage, research, and revelation. Led around the planet by the ghost of his scientific and spiritual muse, Nabhan in turn leads us to a course of action we can actually perform: demand the food we were meant to eat. This moving, often harrowing, always eloquent account shows that by putting humanity back into ecology and vice-versa, much of this world could and would fall back into place." Alan Weisman, author of "The World Without Us" and "Gaviotas: A Village to Reinvent the World"
"Gary Nabhan's travels in the footsteps of the brilliant Nikolay Vavilov make for fascinating reading. But this book is more than a journey into the past; it is look at the future. Vavilov's compelling ideas about famine and Nabhan's exploration of current threats to our food supply—from climate change to loss of biodiversity—make Where Our Food Comes From a must-read." Deborah Madison, author of "Local Flavors: Cooking and Eating from America's Farmers' Markets"
"A riveting account of an extraordinary Russian plant scientist who traveled five continents in search of crop diversity and its importance in staving off famine, told by a master scientist and storyteller of today. Shining through the travels of both is a critical insight: that safeguarding our food supply depends ultimately on our ability to preserve the vitality of diverse cultures the world over." Wade Davis, author of "One River" and "Light at the Edge of the World"
"Biology has its true martyr in N.I. Vavilov, starved to death by Stalin and his henchmen for his rich and necessary insights plus his indefatigable work devoted to discovering, cataloguing and storing the diversity among and within crop plants. By traveling himself, Gary Nabhan has given us a narrative of Vavilov's physical and intellectual journey sure to keep readers up past bedtime."